I've always had somewhat of a penchant for the off-the-wall, so I guess it is the natural progression of things for me to be somewhat intrigued by the garish and gaudy appearance of the NY based trio "Needulhed". 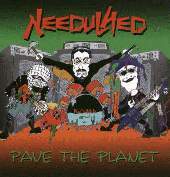 Needulhed seems almost spoof-like, it's hard to tell how serious to take them with names like Mortimer, Weeks & Snip, but they do seem to be a band who loves the theatrics. Even Needulhed can't seem to categorize their own music.... described as everything from rock, to goth, to techno, to punk, to pop..... each song on the CD seems to take on a personality of it's own. It's the type of music you find yourself humming 3 days later whether you want to or not. I have to say my favorites are "Prolificy", the rather funky "Time Traveller", and "Ether". The beginning of "Ode To The Good Stuff" gave me a mental image of something straight out of a "Munsters" episode, but it's fun and catchy (and I do like to hear the word "delicious" repeatedly in a song!) I'm not so sure I like the synthesized frog sounds in "Toasting Marshmellows".... I'll have to give that one some more time to sink in. Needulhed does appeal to the juvenile side, the side that wants to listen to a CD just for the fun of it. The same reason I sometimes listen to bands like "Green Jelly" and "Big Daddy Meat Straw". Ok, so perhaps it's a bit tacky, but I guess I can appreciate a comic-book approach to life at times, and we shouldn't always take ourselves too seriously. Overall, I found I enjoyed "Pave The Planet". So if you want to lighten up and have some fun, check out "Pave The Planet"...... and watch for Needulhed in the upcoming movies "Cannibals" (which Needulhed has written the musical score for), and "Romeo's Run". Not only will they appear in "Romeo's Run", but 2 songs from the "Pave The Planet" CD will be in the soundtrack ("Time Traveller" & "Assault"). In the meantime, I will be humming "I will be waiting" from the song "Prolificy" over and over in my head, because once you hear it...well....uhhh... perhaps that is why they are called Needulhed? !